have Chrome open. This app sits in your taskbar and isn’t necessary but I have found it handy when I’m on my Windows PC and don’t have Chrome open all the time. With either, you get the new UI. That new UI brings all your conversations into a single interface with your contacts on the left and your message trail on the right. No more multiple boxes popping up for every conversations. It is all nicely and neatly contained in one place. For me, this has made my desktop a much cleaner place as I usually have 2 or 3 Hangouts conversations going at any give time (It also serves as my SMS app as I’m on Project Fi). 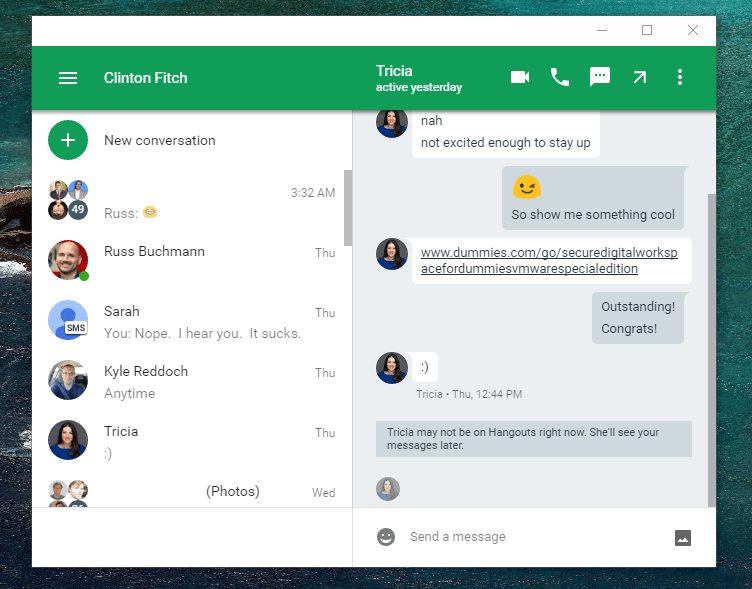 If you have the Hangouts extension already installed in Chrome, it should automatically update to the new extension for you.